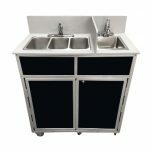 Portable Sink | Portable 4 compartment sink | Monsam Enterprises, Inc. 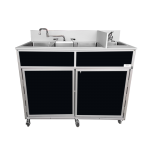 Whether it’s a party or other big event, make sure our portable four basin sink is invited to the party! 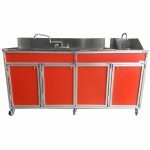 Specially designed for high-volume or high-traffic scenarios, our four-compartment portable self-contained sinks are perfect for use as a commercial portable sink, a food service sink, a portable science sink, a medical sink, a mobile kitchen or a coffee cart portable sink. Clients have ordered these for use in art studios, restaurants, banquet halls and more. 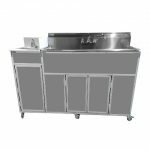 Solid and sturdy, these units all come with six swivel casters with locking brakes to provide mobility OR stability as needed. 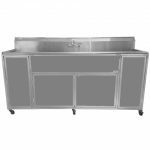 As with all our sinks, these units can be customized to fit your specifications. 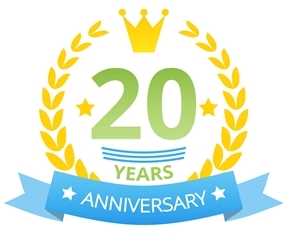 Call 1-800-513-8562 today!